Mercator was born on March 5, 1512, in Rupelmonde, Flanders (now Belgium). After earning a master’s degree in philosophy and theology from the University of Louvain in 1532, he studied under Gemma Frisius, a noted mathematician and astronomer. At this time he also improved his artistic and mechanical skills, mastering calligraphy, engraving, and instrument making. In collaboration with Frisius and engraver Gaspar à Myrica, Mercator constructed a terrestrial globe in 1536. During the next few years, he produced a booklet of italic lettering and beautifully printed maps of Palestine, Flanders, and the world, establishing a reputation as a master cartographer. Between 1554 and 1564 Mercator completed maps of Lorraine, the British Isles, and Europe, and perfected his projection method, which he applied to the 1569 world map that became his most famous accomplishment. The projection method entailed straightening the meridians (longitude lines) into parallel lines and lengthening the degrees of latitude, which distorted distance and land/sea areas but kept direction relatively intact. With this method, Mercator achieved his goal of devising a way for sailors to plot a straight line (crossing all meridians on a map at the same angle) and to follow the projected line without continual adjustment of compass direction. Mercator changed the nature of cartography with his artistic enhancements and forever altered ocean navigation with his projection method, which was the most influential invention of early cartography. Mercator’s talents inspired following generations of cartographers to hone their artistic skills in calligraphy and engraving. Thus, maps of Renaissance Europe were generally elegant pieces of art. In addition, the work of Mercator, Frisius, and Myrica made Louvain a center of cartography and navigational­ instrument making during the sixteenth and seventeenth centuries, times of expanding world exploration. 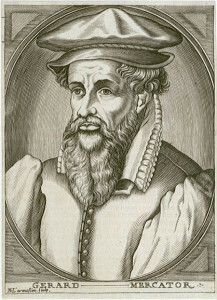 The value and importance of Mercator’s projection method was recognized only at the end of the sixteenth century, after his death. Navigators at first regarded the projection with suspicion because it greatly distorted distances; they were accustomed to their own methods and were reluctant to change. Material promoting Mercator’s projection was published in 1597 by William Barlowe and in 1599 by Edward Wright. Wright provided a table of “meridional parts” that explained how to compute a distance correctly, and sailors were eventually persuaded of the projections merit. It vastly facilitated navigation, sped ocean passages, and reduced sailing disasters from the seventeenth century to the present. Posted on March 10, 2015 by Natalie. This entry was posted in Cartographers. Bookmark the permalink.